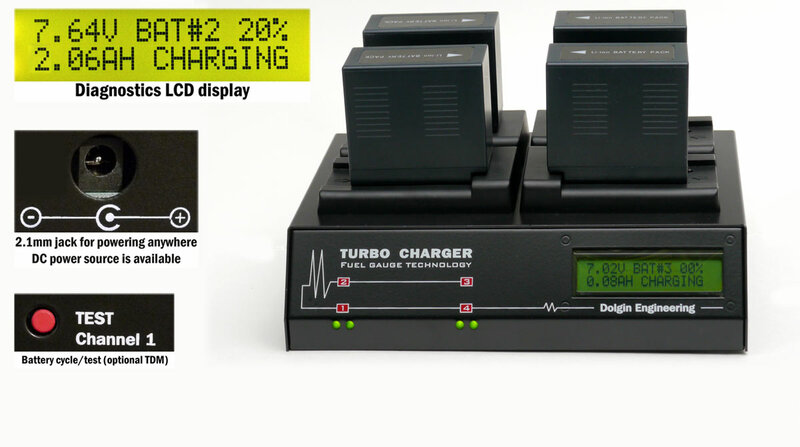 PLAY DEMO VIDEO TheTC400 four position battery charger accepts Panasonic AG-VBR (AG-AC30, UX180, UX90, EVA-1, etc. ), VW-VBG6 (HMC150/AF100/AF100A), Sony L/M (VX-2100 etc), Canon BP (EOS C300, XL2 etc. ), JVC BN-VF823 (GY-HMXX etc.) and many other battery packs (each configuration comes with its adapter plate as ordered). Compatible with Non-OEM batteries. "..overall, this is one of those "gotta have" tools for a working shooter, as the benefits far outweigh the costs..."
"In the field, we tested it under battlefield conditions: an annual four-camera shoot lasting all day and into the evening... "